With the holidays coming up, many of you will be travelling out of town and away from the comforts of home sweet home for a day or even several days. Unfortunately, if you’re flying you’ll need to check your bag if you want to bring your kit/case, which I’ll get to in a minute, because us crafty people might be tempted to get a bit too stabby with the passengers (only kidding… maybe…). Or at least that’s what TSA seems to think. BUT if you’re doing it the old fashioned way of loading up the car and trekking a few towns or states over, then you only need to worry about not getting too stabby with the other occupants of the automobile. Not sure what the rules are with buses and trains, you’d need to looks those up. Tongue-in-cheek humor aside, you’ll also likely be thinking about how you might be able to bring your projects along with you. Knitters and crocheters have travel project bags. As do those who do blackwork, cross stitch, embroidery, english paper piecing, hand quilting, applique/wool applique… even spinners have travel wheels (one of which I’m hoping to get under the tree myself). Fret not, here are some ideas as to how you can bring your felting projects along with you as well. Any sort of family-gathering that involves hanging out together in a dwelling - why not bring an extra? They can come in various shapes and sizes, and you might even have something on hand that would work. For example, here is one that’s small enough to fit in a medium-sized purse, a back pack or diaper bag. This is a vintage gilded tin that I picked up at a thrift store a while back. I enjoy collecting and repurposing tins for storage around the house, so that wasn’t my original intention when I found this beauty, but something about it made me think to try turning it into a travel case. And so I did! It’s around 2 inches deep, so it would fit a standard needle felting foam if you cut it down, however I chose to use some scrap packing foam. In fact, right now, as your Black Friday steals start coming in, and later when you and others are opening up gifts, keep your eye out for packing foam you’d be able to use for this purpose. It does wear down faster than the foam you buy for felting, but it didn’t cost you a dime, and you can spare your big foam from being cut up. The 3x5 felting brushes some people use would also fit in something this size. To keep the needles from knocking around the tin and possibly getting damaged (or any accidental stabbings), I just stick them in one end of the foam. Pen tools come with a cap, or if you use needles without anything on them, you can also use bead tubes to store them. The rest of the tin gets stuffed with wooly bits and a small square of felt. Because it fits in my everyday bag, this felting tin has come in quite handy, both when having to wait to get my car inspected (because I have to bring my kids along, we walk over to the BK with a playground next to the shop where I felt while they play) or even to make a simple demonstration/allow others to try when explaining needle felting to someone completely new to it. That happened to me at the cash register at a fabric store when the cashier asked me why I was buying so much felt, LOL! For those of you who want to work on projects that might require more wool, rather than something small just to keep yourself busy, this next case will do the trick. This case is amazing, and it doesn’t break the bank. If you’re lucky enough to have a Harbor Freight nearby, go and check it out (this is something they’ve carried for a number of years, and I imagine they plan to continue carrying it for a while longer), or order from their website online - and don’t forget your coupon! Just like everything else in their store, it’s a knock-off a brand name case at less than half the cost. This particular case is the medium 20 bin one - at first I thought it might be too shallow to fit a 2 inch foam, but it fit in there perfectly. If you do need a deeper case, there is a large 8 bin case for a few dollars more, and if you wanted a smaller travel kit like the one I showed above but can’t find any good containers for it, there’s a small 15 bin case that’s basically the the same as this one except cut in half width-wise. The bins inside are configurable, so you can decide which ones to take out and which ones to keep depending on your needs, and the lid has notches in it to keep the bins in place instead of sliding all over the box inside. And the handle, dare I say, is quite handy. Here I’m showing you one of the many ways you can configure the bins. On the top right I have an 8x10x2 felting foam (just a little smushed in). Remember that packing foam I mentioned earlier? Same idea here, except it’s cut to fit one of the big bins and used to transport my needles, since there isn’t enough room to stab it in the side of the foam. 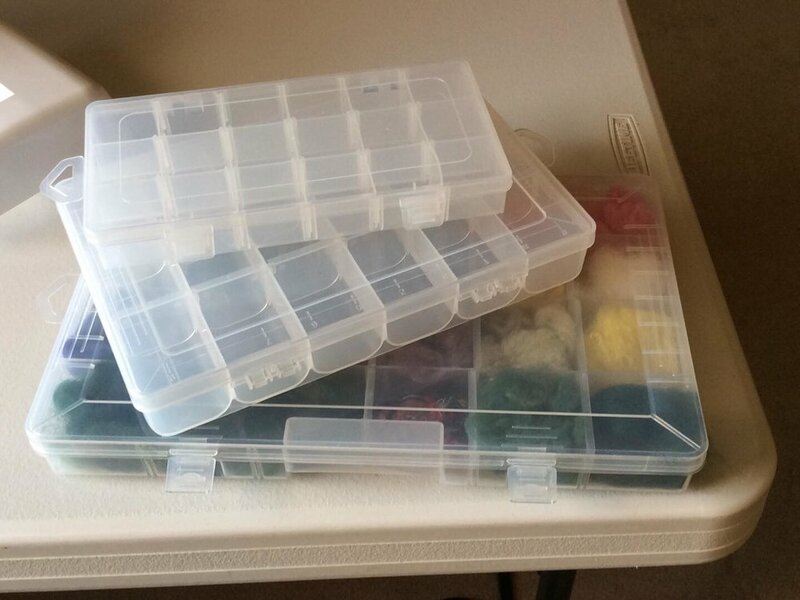 The smaller bins can be used to sort wool bits of various colors - especially handy for plein air felting where you need small amounts of various shades to get the colors right. If you are working on a specific project with a limited color palette, but more of those colors are needed, switch to the larger bins. I placed two bins on top of the foam to show you that you could also cut the foam down a bit more if you needed more bin space. If are okay with carrying your foam separately, feel free to use all the bins, or even try taking some out (thanks to the lid that helps keep them from shifting) so you have a decent amount of space for core wool. Bonus tip: for those of you who teach classes and have a bit of expendable income, you can get one bin for each student (not for them to keep of course, unless you want to figure that into the cost, maybe for a session of classes) and set them all up with the foam, needles and wool that they will need for the class. Strap them all on a dolly/cart and wheel them into class - at the end of the class they take their items home and you have your cases to set up for the next class. Last, but not least, I wanted to share the storage a friend of mine, Gail from Feathertree Felt, uses when she goes to meet up with her needle felting group. She said she found these on clearance at Michaels as a set of three, and it looks like there are plenty of storage places in the large one (24 if I counted correctly) for a nice-sized palette of colors. While you can’t rearrange the spaces themselves, you can take out the dividers if you needed to as she has in the photo below. Here is one of her works in progress that she’s been working on the go. Don’t you just love the little flowers peeking out from under the case? So keep your eyes peeled for some storage ideas, and check a couple of different places for storage ideas, like thrift stores, craft stores, home improvement/construction, discount retailers that sell odds & ends (like Big Lots, Homegoods or Tuesday Morning type stores) while you’re out crossing off your holiday shopping list. If you find any neat travel cases that weren’t mentioned here (maybe something one-of-a-kind like a tiny vintage suitcase?) please share them in my Facebook group! If I get enough submissions I’ll make a new post sharing all the cool inventive ways that all you creative people come up with to travel with your work.